In order to customise the design and layout of your page you need to use the options within the appearance tab. These options may vary dependent on the theme that has been applied to your site but this guide will give detail on a few of main options. 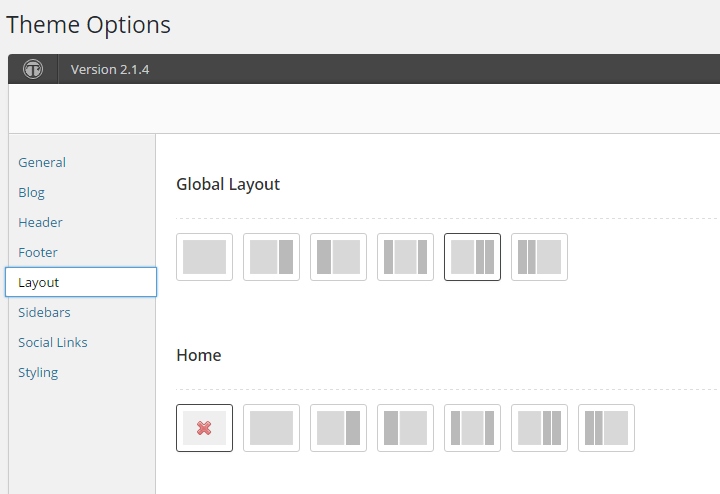 You can choose to change the theme for your site using the options within the ‘Appearance’ menu on the left hand side. This will allow you to choose from a wide range of different themes, suiting different purposes and styles of page. From within the Theme options window you can choose to ‘Live Preview’ a theme or activate it for your site. Different themes will allow for different levels of customisation, but in general you will be able to change the colours and content of the pages of a theme. The customize options allows you to enter a live preview mode where you can customize parts of the site and see the effect without making changes to the live pages. This is the easiest way to change visual elements of your site. All of the options are also available directly from the dashboard. Once you have made changes using the customiser, make sure to select the ‘Save & Publish’ options to make your changes live. The site identity options allows you to change the title and tagline of your site. The tagline will normally appear under neath the title in the header of your site. 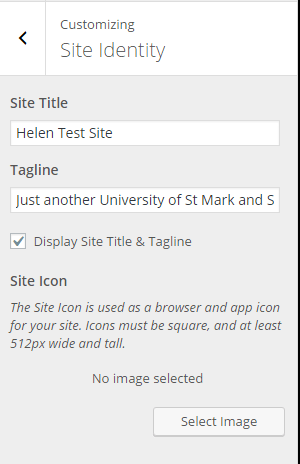 By default it is set to ‘Just another University of St Mark and St John Sites site’ and this can be changed within these settings. You can also add a Site icon, this is the image that will appear next to the page name in the browser tab or as the image displayed as an app icon. Widgets allow you to edit the content shown in the sidebars of the site. There are a wide range of widgets to choose from including; custom menus, custom HTML and featured posts. 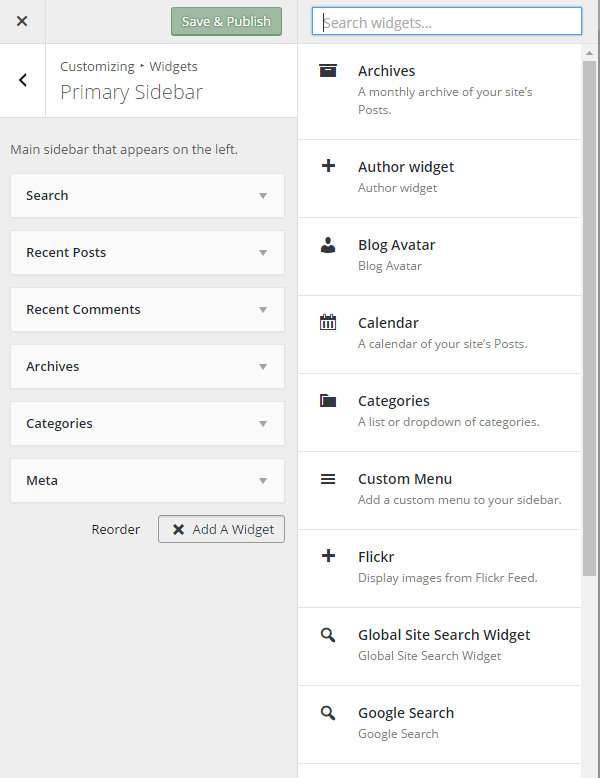 To change the widgets in each sidebar you need to first choose which sidebar you are editing. This will open a list of the widgets currently active for that sidebar and allow you to change and add different widgets from the list. Most themes will support at least 2 menu locations which you can edit. 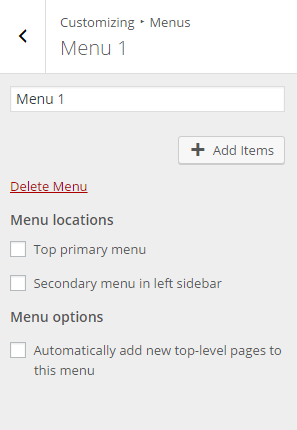 To add a menu to a menu location you must first create a menu using the ‘Add a menu’ option. You can then add items to your menu and select the locations in which it will displayed on your site. With a lot of the themes you will be given the option to change the background of the site, this may vary between simply changing the background colour or adding a background image. Often this will be found in the customizer but sometimes can instead be found in ‘Theme Options’. 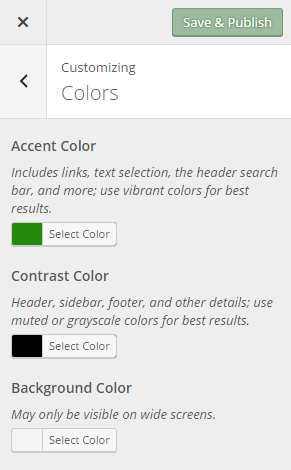 Most themes will allow you to change the colour scheme of your site using the colour options in the customiser. Within the customiser it will generally give further information about where the colours will be used and allow you to see them in the live preview on the right hand side. You might also be given options to change the layout of pages on your site. This will allow you to choose the location of your sidebars. This will often be found in the theme options. By default the front page of your site will be set as your blog feed, however, you can choose to have a static front page instead. This allows you to edit the content on the front page of your site and your blog will be held on a different page. This will allow you to choose a different page from your site to be shown at the front page. You can then edit this page to show content of your choice.